Big News: BBC Replica Trilithon Rediscovered—Just in Time for Clonehenge’s Sixth Birthday! We are [please choose one: 1. surprised 2. confused 3. incredulous 4. amused 5. shocked 6. spannered] to announce that today is the sixth anniversary of the founding of the Clonehenge blog! 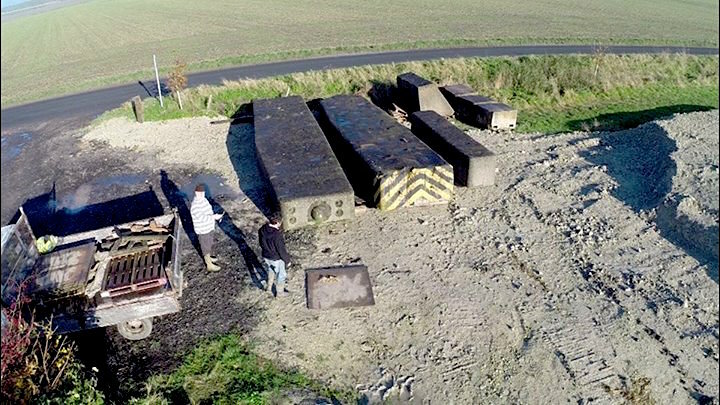 And to celebrate it (or rather completely coincidentally) recently renowned Wiltshire farmer and long barrow builder Mr. Timothy Daw, along with well known television presenter and Stonehenge scholar, Mr. Julian Richards, have inaugurated a new and historic project: the resurrection of a 1990s BBC concrete replica Stonehenge trilithon! You can see the original completed concrete trilithon in the photo above. Only a few times in the six years of its existence has the Clonehenge blog covered actual Stonehenge replica news. There was the story of the pink Granite Stonehenge in West Australia, its stones being left at the quarry when the man who commissioned it ran out of money, and its subsequent acquisition by the Beales and installation on their cattle farm; and then of course there was, and remarkably still is, the only full-sized illegal guerilla henge, Achill Henge on Achill Island in County Mayo, Ireland. That one was supposed to be taken down immediately, but three years later is still standing! And now we have this romantic story of the concrete trilithon lying in pieces in a car park since the 1990s, only to be discovered, claimed, and transported, with plans for its resurrection—on the Wiltshire farm of the discoverer of the missing Stonehenge stone parch marks, Stonehenge caretaker, and long barrow builder, megalithic superstar himself, Mister Timothy Daw. We are looking forward to next year, watching the progress as various transport methods are used to move the concrete stones, and the trials are filmed for television. (By then no doubt Mr. Daw will be forced to stop every few moments to give autographs, which could slow things down a bit. Haha, we certainly hope he is a good sport.) This is a wonderful project, and we thank all involved, for photos, information, and for giving our whole staff here at Clonehenge something to crow about as we complete our sixth year of nonsense. The smiles you see on all three people in the picture above are the smiles that Stonehenge replicas create wherever they are found. We have loved recording them and being party to this odd corner of human nature for so many years! We see no sign that henge building is slowing down or going out of style. We know we haven’t been posting much here on the blog lately. Some people tell us they no longer have time to read blog posts and they now only track their Stonehenge replica news on our Facebook group, Facebook page, or on Twitter. Of the three, we would have to recommend the Clonehenge Facebook group, because the most action and up-to-the-minute reports take place there. But once in a while we’ll return here to record something special. And until the next time comes, dear friends, we wish you some very happy henging! ← Goodwood Revival Stonehenge: White-robed Druids, Cardboard Obama, and Then We Digress!